A few years ago, I had an awkward and heavy load delivered to our house from the farm store. The young man who drove the truck had a hard time getting up our super steep driveway, then difficulty backing his trailer into the spot where the load had to be set. He was obviously annoyed at the situation, but kept at it until he got the job done right. He did such a great job that I called the manager at the farm store and complimented the way that the farm store employee handled himself. The manager was shocked at my call. She seemed to wonder if she had misunderstood what I was saying, because she asked me to repeat myself. So often we are just too distracted and busy to remember to be grateful, aren’t we? I’m so glad that the month of November gives us a much-needed reminder to be thankful. If that reality is not a kick in the pants reminder to give God a little thanks and praise today, I just don’t know what is! 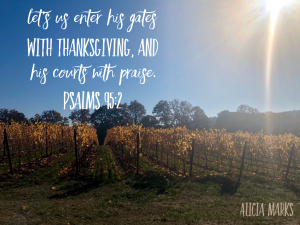 This year, lets use the month of November to get into the habit of consistently remembering to be thankful to God, not only for what He has done, but for who He is. Our grateful heart will usher us right into the presence of all-mighty God. We don’t want to miss that!